Huey is out by Ch Char’s Strike N’ Gold ROM x Char’s Prima Ballerina. He is ranked #1 in Grand Champion in lifetime points with AKC ever in US history. Multi Best in Show and Best in Specialty winner in 2014, 2015 and 2016. 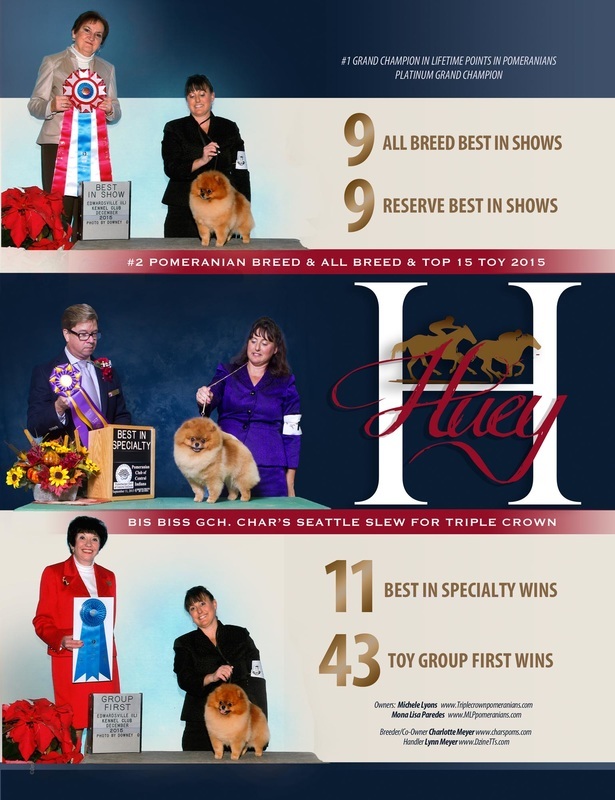 2014, 2015 and 2016 American Pomeranian Club’s #1 Pomeranian. Current record is 9 Best in Shows All Breed, 9 Reserve Best in Show All Breed, 15 Best in Show Specialities, 50 Group 1’s, and 100’s Best of Breeds! 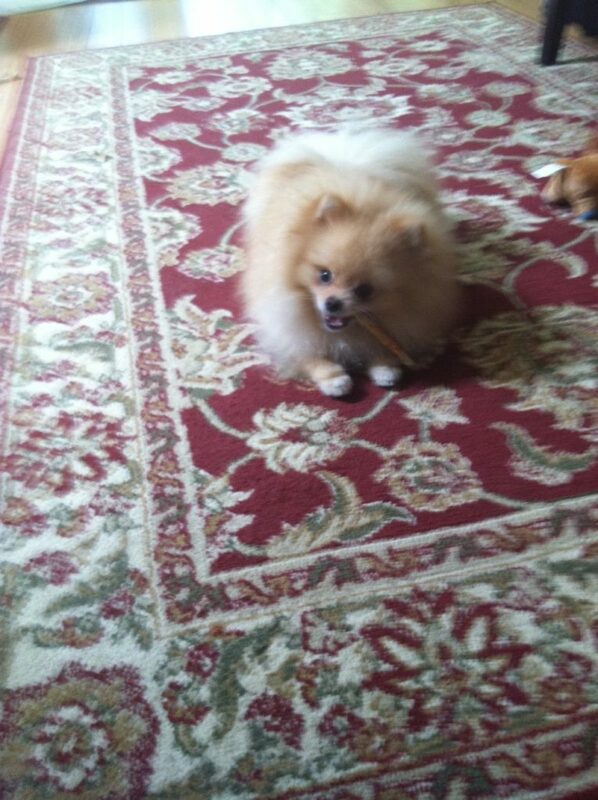 His is proudly owned by Triple Crown Pomeranians and is now retired and standing at stud. 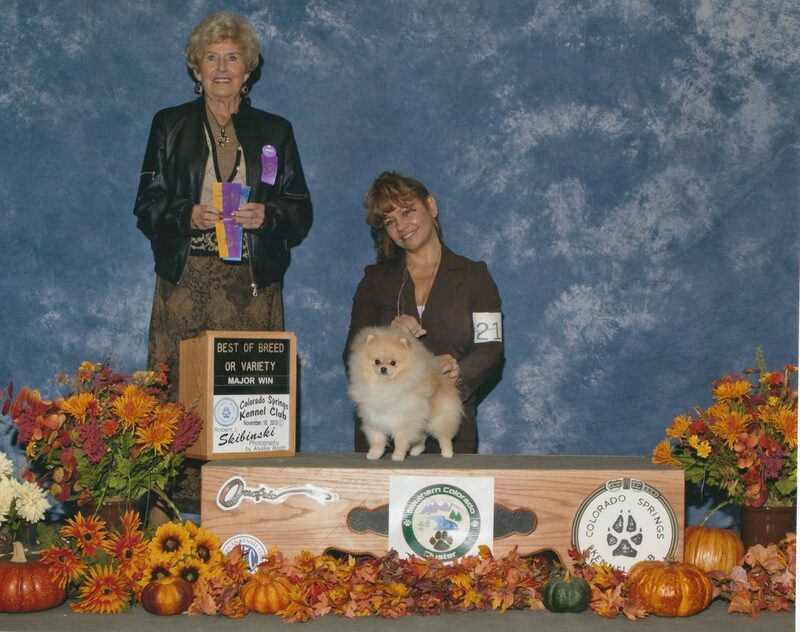 Huey’s show career was sponsored by MonaLisa Paredes, Kathy Stuart of K-STARZ Pomeranians and Cindi Cardoso Iken of Pismo Beach Pomeranians. He ended his show career with an Award of Merit win at the 2017 Westminster Dog Show. 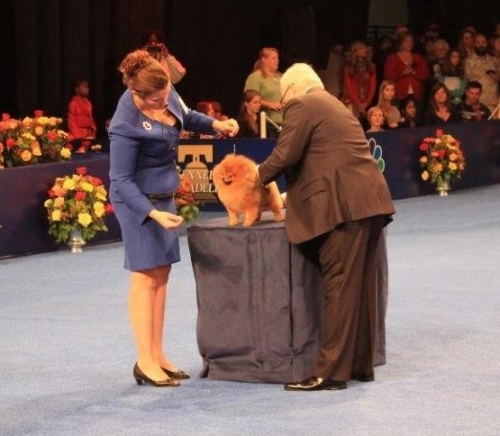 GCh “Logan” is from Dee Little’s Pomeranians by Ch Aphrodite’s Thank You Daddy ROM x Bachman’s Sweet Escap to CR ROMX. Thank you Christine for entrusting us with him. GCh Logan is a multi group placer and won Best of Breed in 2013 at the National Dog Show. Logan is featured above on TV. We are excited to bring his type, coat, coloring, and short back to our breeding program. Our first bred by male show prospect “Timmy” by GCh TNT’s Dynamite Detonation x Nowlands Strut’N & Scream’n Savannah of Triple Crown. Timmy was shown at his first show in Pueblo, CO in 11/2013 and went Best of Breed twice with a Group 4! Timmy finished his championship in Denver on Valentine’s Day going Best of Winners with Theresa Tafoya. He received a Group 2 placement the show prior. He is a very spoiled beloved dog. He is my husband’s spoiled baby at our Denver home and would much rather be a lap dog than a show dog. That all changed in 2018. At the age of 5 we “dusted” the boy off at the age of 5 to obtain his Grand Championship. My husband was very sad to lose his baby for a few months. In two weekends of show with my BFF Theresa Tafoya-Montano he has garnished several Best of Breed major wins and is half way towards earning his Grand Championship. Keep it up Donny, your daddy Chris wants you home soon. 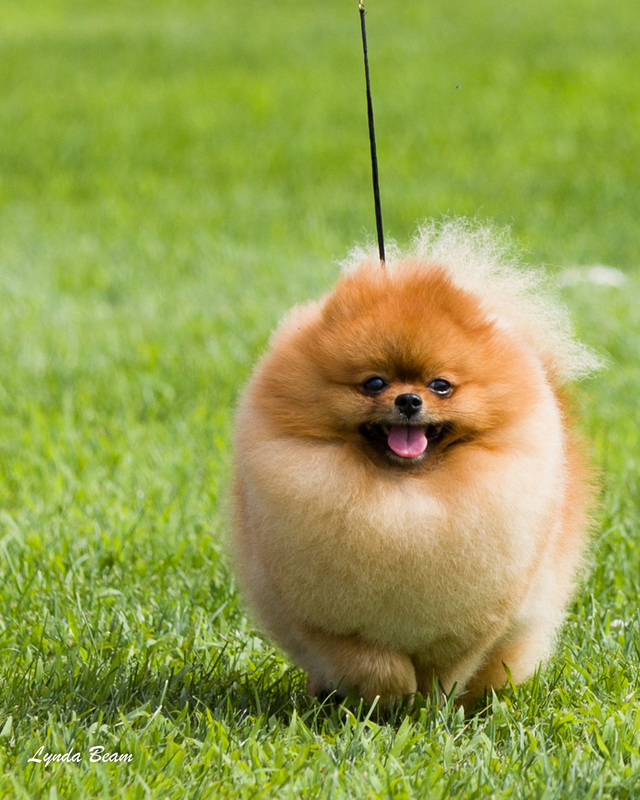 TNT Pomeranians is expecting a few litters from Ch “Timmy” this year.